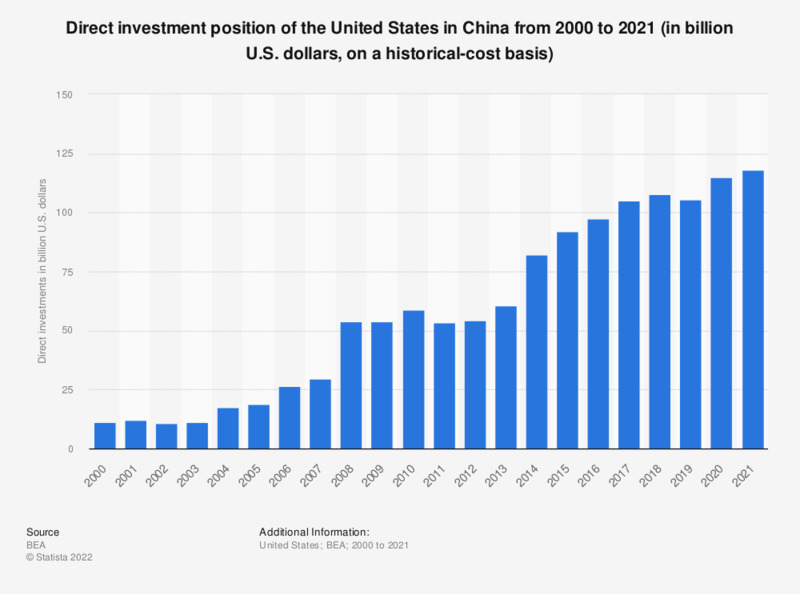 This statistic shows the direct investment position of the United States in China from 2000 to 2017, on a historical-cost basis. In 2017, the U.S. investments made in China were valued at approximately 107.56 billion U.S. dollars. Foreign direct investment (FDI), simply put, is an investment of one company into another company located in a different country. It differs from a traditional way of investing into shares of foreign companies listed on a stock exchange. The companies which make foreign direct investment usually own a part of the company in which they invest and they have influence on the decision making process. In the United States, FDI is defined as an American investor (called the U.S. parent) owning a minimum of 10 percent of a foreign firm (known as a foreign affiliate). The total direct position of the United States abroad amounted to 6.01 trillion U.S. dollars in 2017. Although the phenomenon profits greatly from the technological advances of the 21st century, as well as from the cultural flexibility of today’s workforce, FDI has a long history, going back to the colonial empires. Not without critics, FDI is generally believed to bring advantages to the investing company, such as access to new markets and decreased costs of labor, materials and production facilities. The local economy can benefit from an infusion of capital, access to new technologies and engagement of native labor pool. There are three recognized types of foreign direct investment, namely horizontal FDI, platform FDI and vertical FDI, along with various methods of implementing the investment itself. FDI considered by many one of the motors of worldwide economic growth. U.S. foreign investment abroad has seen a dramatic growth in the past decades. In fact, the United States topped a ranking of the leading countries worldwide in terms of direct investment outflows, worth almost 300 billion U.S. dollars in 2015 alone. Multinational American corporations, especially focused on manufacturing, have largely invested in facilities overseas, due to financial benefits. However, a large share of these corporations focuses toward not only supplying the U.S. market, but also the local markets in which they operate. In 2017, the country that received the largest amount of U.S. foreign investment was the Netherlands, with a little almost 936.73 billion U.S. dollars, followed by the United Kingdom and Luxembourg. Overall, the total amount of U.S. dollars invested in European states that year reached 3.55 trillion U.S. dollars compared to 1.68 trillion U.S. dollars a decade prior.